You never know what is going to inspire a tablescape. This one started with orchids which were thoughtful gifts deserving special attention. Orchids made me think of Thailand where the markets literally had bags stuffed full with purple, pink and white blooms. That thought led me to choose this beautiful handwoven silk table runner that was made in Bangkok. 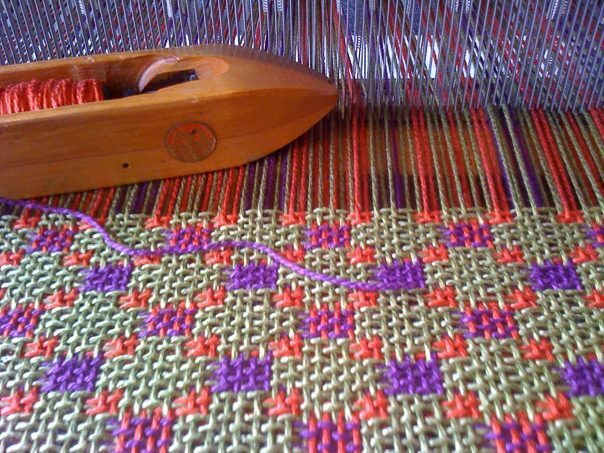 Thanks to Jim Thompson, the weaving as a cottage industry is alive and well there. The runner paired nicely with placemats purchased from a street vendor in that same city. I love finding things for the table that are light and take little suitcase space when I travel. Because it is spring, a season of gardens bursting with color, these dishes that once belonged to my mother-in-law seemed a nice complement all the pink tones. According to the writing on the back, they were handpainted by a woman named Ernestine in Salerno, Italy. I believe they were sent home by a soldier husband during World War II. I would love to know the whole story. OK, Thailand and Italy are covered, so let’s go with napkins from a Saigon market. Each little flower is hand embroidered. In addition to this table showcasing pieces gathered from my travels, it also confirms my attraction to all things hand done. All that is left to complete the table is glasses, and they, too, have a story. I don’t know where they are from, but they belonged to a special friend’s grandmother. My friend thought I would use them more than she and gave them to me. She was not wrong, and the glasses with their wonderful texture are much used. So many of my tables are filled with special memories of people and places. This one, with its international flair, is especially so as with each piece my mind wandered to another place and the experiences had there. Love those vibrant pink place mats & table spread ! Linda, this tablescape is absolutely wonderful. I love the stories related to each piece. Your posts are always lovely and interesting, but this one may be my all time favorite. Lovely colorful table. How special to have pieces that remind you of friends and travels. Beautiful colors make your beautiful tablescape! Thanks for the follow as well! I try to share tablescapes, gardening and travel! Glad you can stop by once in a while!